This small and charming adobe house had acquired its name by the mid-1800s because of the weathervane on its hipped roof, the first of its kind in Monterey. 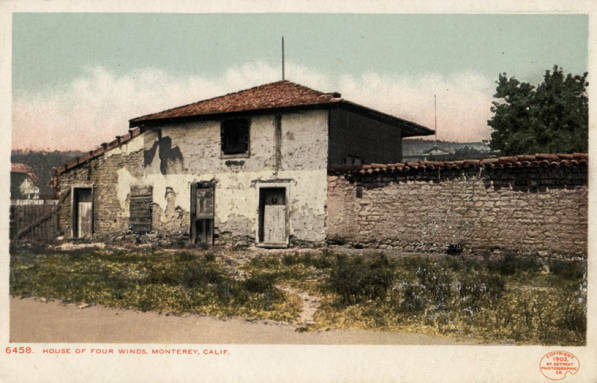 Sometimes called by its Spanish name, La Case de Los Vientos, it was built in 1835 comprising of a large piece of property developed on Calle Principal by Thomas O. Larkin, the first and only U.S. consul to Mexican Alta California. This house was first used as the residence of the Spanish governor of Alta California Juan Bautista Alvarado, who later gave his name to the one of the main streets of downtown Monterey. Later, William S. Johnson designated it as the first Hall of Records in the State of California for the newly formed County of Monterey. 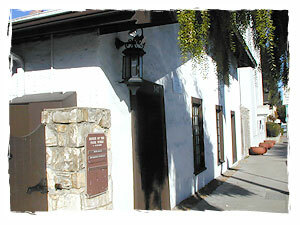 The Women’s Civic Club was one of the first groups to encourage the preservation of the historic adobes of Monterey in 1906. The House of the Four Wind was purchased by the WCC in 1914 and transformed it into their club house with additions to the rear of the building. This adobe is believed to be the oldest such club house in the U.S.
Restorations on this building include the original front section and the entire second story, which have been lovingly furnished and restored in the style of 1850s. The charming facade still faces the street.